The freshly minted party is busy pounding the constituencies. SingFirst has been busy at Marine Parade and Tampines. 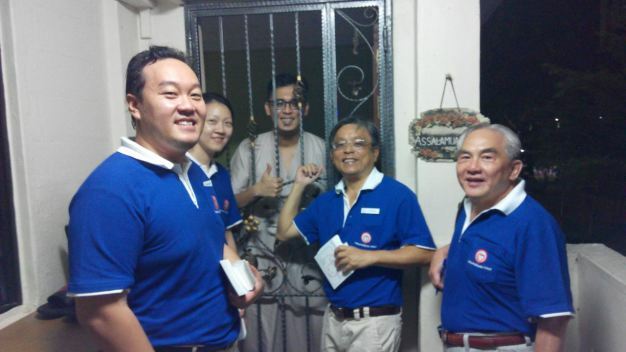 It was definitely a fruitful night for SingFirst on their walkabouts in both Tampines and Marine Parade GRC’s yesterday. We were warmly received in all the six wards that we went to, especially in Chai Chee where 4 members of the public spontaneously joined in our door to door visits. The majority of the residents who were at home gamely took our pamphlets. Some even asked if election is around the corner and when is the exact date. There were also residents who invited us into their home for a chit chat. A lot of introduction about SingFirst was also communicated in different languages and dialects. With these visits, more voters are now aware of and familiar with the name and logo of our party, what we stand for and what we intend to do for Singaporeans when we get into Parliament. We will step up our walkabouts in the weeks and months ahead.